My son' s kindergarten teacher sent home a new craft for me to share with you. It's cute and you can make it as easy or hard as you like--depending on the age of the child. 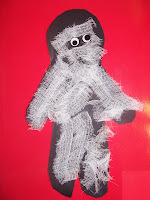 The children were concentrating on the letter M last week and the teacher wanted to make a Halloween craft that centered around M. She found this cute Mummy and thoug ht it was perfect. First you need a pattern of a body shape for the main craft. Here's the part that you can make more or less difficult. If you have younger children I would cut the figure out for them. 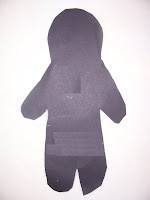 If you have older children you can draw the pattern and have the children cut it out. Next you will need to take the gauze and cut it into strips. This might be a little difficult even for older children to cut as it is very flimsy--it's probably best if you cut it out. Have the children cover the cutout with glue--everywhere. Then they place gauze all over the figure to "mummify" it. Finally, add some eyes and he's perfectly frightful. Activities and educational games- categorizing, sorting,etc. Also, had really cute print-outs for little science experiments. I still need to explore it, but liked what I saw so far!! Have a wonderful Monday! Also, stop by my blog- running a contest today.